. Published on January 24, 2019 . This cat is either very angry or very bored. Either way, it doesn’t say much about my writing. You know who has no compassion for creative writing? Cats. Cats will hinder you at every step of the process. Many people keep cats as companions, or to catch mice, or to spot the ghosts in the house that are invisible to human eyes. 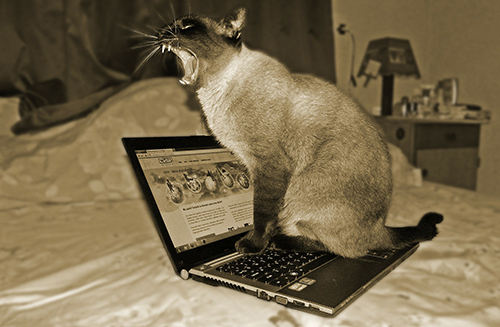 But don’t fool yourself: a cat’s biggest job is to ruin your writing. It doesn’t matter how you write. If you prefer, as I do, to write a first draft on a notepad with carefully sharpened number two pencils, then the cat will decide there is nothing better to chew on in all the world than those pencils. I’ve tried it myself and don’t understand the allure. Prefer to write with a ballpoint pen, furiously scribbling your greatest sentences into your journal? Rest assured your cat will assume it is the proper time to recall her predatory instincts and attack the pen as it flits about like a wounded bird. 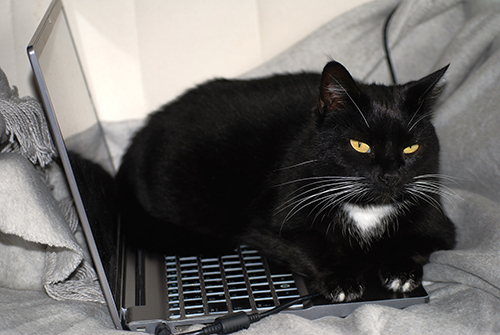 Of course, for cats, the greatest invention of all time is the laptop. 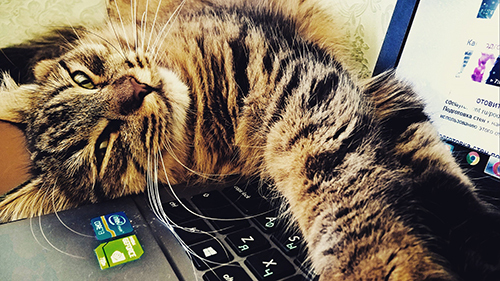 No matter where you are sitting in your residence, and no matter how crucial a moment you are at in your manuscript, your cat will traipse right over. I have tried hiding in my attic to pound away at several precious sentences but still my cat arrives on the scene. It’s not affection or cuddling she’s after. She merely wants the warmth emitting from the 11.1 volts of the battery. If getting there means erasing my life’s work, so be it. Do not attempt to put alphabetic text onto my heating pad! Whenever I bring up this topic during a lull in conversation at a swank dinner party, everyone comes to the defense of the cats. No one sticks up for the writers, who are called rude, selfish and devoid of empathy. Cats, on the other hand, are regal! Cats are inspirational! Cats can purr but all you do is complain! One woman I know, a fiction writer with the initials JH, went so far as to tell me her cat, Moxie, is her editor. I don’t doubt Moxie is a good editor. She can, after all, see the forest for the trees I’m told. But if Moxie has that kind of agency then so must each member of her species. Cats know what they’re doing; it’s willful obstinance and a subversion of the creative process. Cats do not feel writing is necessary to the enrichment of life. Moxie expresses her indifference at the day’s toiling. In carrying on with this argument, individuals will further dispute my claims by citing perhaps the most cat-friendly writer in history. Yes, look what happened to him. And I don’t mean that chilly July day in Idaho, 1962. Hemingway went through four wives, at least three of whom would not hold him up as the paradigm of success. He was known for his terse, economical style. He had to work fast and lean, you see, because his many polydactyl cats were always coming to destroy his work. I’d love to go on, but I have to submit this immediately. My cat just came in the room.